I travelled over to Shropshire today to run a National Indoor Climbing Achievement Scheme induction workshop for course directors and staff. The weather was stunning so it was a bit of a drag having to spend the whole day indoors but the guys on the course made the day enjoyable and interesting which made the trip worthwhile. I was running the course at a large activity holiday centre with its own indoor climbing wall as well as a number of outdoor climbing towers. It was Jon's last day today and the objective was to do some more scrambling and have a bit of a revision of some emergency ropework for hill walkers. We decided that the easy way up the NW Face Route would be a good challenge to get on to Seniors Ridge and would also give us plenty of opportunity to have a look at some emergency rope work. We then made a descent of the lower section of Seniors Ridge. I was out again with Jon today. The main aim of the day was to have a go at Crib Goch but Jon did so well we ended up doing the Snowdon Horseshoe as well in fine style and in good time. A fantastic day, stunning views and great weather. I was out and about with Jon today who wanted to be pushed a bit on some scrambles here in sunny Snowdonia - well not so sunny today. The weather was pretty grim (wet, windy and misty) but we decided that the North Ridge of Tryfan would be appropriate but we made such good time that we managed to bag Bristly Ridge as well. It was really unusual to have the summit of Tryfan to ourselves today and we only saw 7 people and a lost Spaniard all day. I thought he was joking when he asked us where he was as he was supposed to be heading for Pen y Pass!! Despite the weather the guys that turned up for this weekend's workshop were really keen to get out and consolidate some skills. With a slightly better weather forecast for Saturday we decided to look at short roping and then improvised rescue on the Sunday. We went over to Cwm Idwal and climbed the NW Face Route up to Seniors ridge and then made a descent of Seniors Ridge Direct which takes a line just below Suicide Wall. The second day was a bit of a wash out but we decided to go to Tremadog and hope that we could get some shelter from the rain - fat chance! We took shelter around the Oberon area and worked on some key rescue skills separated by a "chat" in Eric's Cafe. I was running an AMI Short Roping Trainee Workshop today, The weather was absolutely stunning so we decided to start off on Tryfan Bach and then progress on to the East Face of Tryfan. Denny, Mat and Mike did a great job climbing North Buttress Variant and then we made an descent of North Gully and Little Gully. We covered topics such as coils (hand and body) and locking them off (or not), moving together, pitching, anchors, belaying, lowering Top photo: Tryfan Bach. Bottom photo: The start of North Gully Variant. 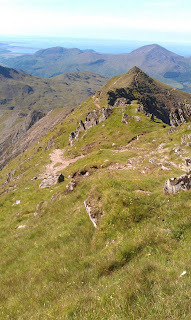 I was working on Snowdon Today for Jagged Globe looking after a charity fund raising event in the area. 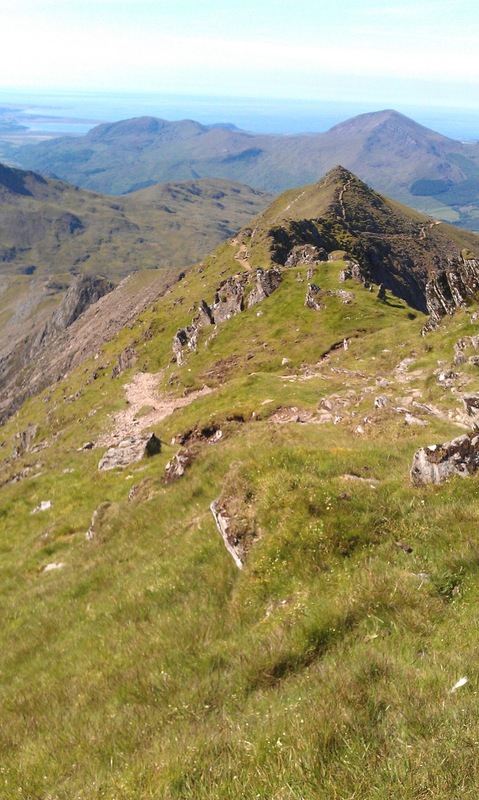 It was a great day for the competitors to make ascent of Snowdon as it was perfect weather. The team were taking part in the Snowdonia Charity Challenge which entailed Cycling around Snowdon, Making an ascent of Snowdon via the Rhyd Ddu path and a canoe race on Llyn Padarn. Well done everyone for a big effort and raising money for a good cause. The photo is taken from Bwlch Main looking towards Yr Aran.